The November meeting will be held Saturday, November 10th at 9:00 am at the home of Ed Tunstall and Susie Smithwick. 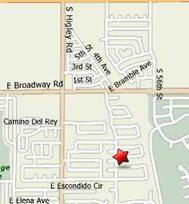 They live 5439 E. Dolphin Ave, Mesa, (480 - 654 - 2107). The meeting is Election of Officers and Honey Bear will cater a brunch. Everyone is invited to bring a side dish. Please bring your own lawn chairs. There will also be a drawing for a koi and a goldfish, so please bring your own buckets. From the north, St. Rte 51 or the I101 to the I202. East to Higley. South on Higley to Broadway. Left at Broadway to S. Sunnyvale. Right on S. Sunnyvale to Dolphin. Turn left on Dolphin. From the south: US60 to Higley, North to Broadway, Right at Broadway to S. Sunnyvale. Right on S. Sunnyvale to Dolphin. Turn left on Dolphin. Dan Stough talked on bog filters. The lecture was very informative. Dan covered aerobic and anaerobic conditions, bog material, and top and bottom draining filters. He had an excellent handout. The October meeting was held at the residence of Tom and Carla Briggs. President Elizabeth Good opened the meeting at 9:10 am. Quite a few members were in attendance. 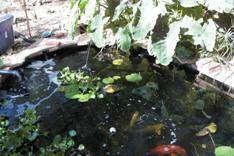 The Brigg’s backyard was centered around a koi pond with several bog filter ponds connecting to it. The weather was unseasonably warm and the shade provided by the trees and patio was welcomed. A motion was made to have a private pond tour next year, one not open to the public. Details will be worked out later with the new committees.